ACTION ALERT!!! 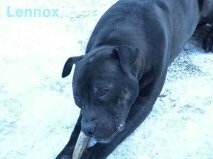 !LENNOX: PLEASE HELP TO SAVE THE LIFE OF THIS INNOCENT DOG!!!!!! HIS TIME IS FAST RUNNING OUT!!! IMPRISONED FOR A YEAR ON DEATH ROW, HIS TIME IS FAST RUNNING OUT!!! It is totally unbelievable that with all of the protest, the outrage and the measures that LENNOX’s family has taken to free their beautiful boy, from the clutches of the authorities, that LENNOX remains on DEATH ROW. WHY???? Because of the mistaken identity of him due to his appearance….it has been proven that LENNOX is NOT a PITBULL. It is incomprehensible that the Courts having this knowledge have not freed LENNOX allowing him to return to his beloved owners. That the Magistrate in this case has not reversed his decision which condemned LENNOX to death over a year ago. LENNOX has been held in his prison and denied seeing his human family. The continued emotional pain that LENNOX’s human family suffers is great, the pain and suffering of LENNOX is equally as great. LENNOX has done absolutely NOTHING to warrant a Death Sentence. No one has ever come forward to claim that he has ever bitten anyone while in the care of his family. Seized ONLY because he resembles a PITBULL..a serious mistake..which can and will result in LENNOX being put to death if a miracle does not soon happen and the Magistrate reverses his decision. Admitting to and acknowledging a mistake is a courageous and responsible thing to do, is it not??? In a follow-up statement (PDF received by email today) issued by Animal Behaviourist Sarah Fisher (who did an assessment of Lennox and testified in court) this follow-up statement was issued as Ms. Fisher puts it “I do care however that Lennox is being portrayed in a poor light through this video clip as my experience of handling Lennox was thoroughly enjoyable and I now feel the need to explain in greater detail the truth, as I see it, about my assessment”. Note: this short video clip has been circulating on the Internet. Ms. Fisher goes on to say that LENNOX “showed excellent impulse control at all times”..” Lennox was so gentle with the taking of the food both in the crate and also later in the car park. He was also appropriate in his behaviour with the games we played” . Anyone who has handled an animal rescue knows full well that the animal may show signs of extreme nervousness towards a stranger, visible trembling, perhaps even growls, feeling terrified and alone, exhibiting anxiety accompanied by possible barking. This is all very normal and to be expected. Experience has taught animal rescuerers and handlers well. 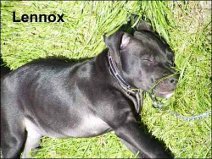 To learn more about LENNOX and the continued FIGHT to save this INNOCENT dogs life, please go to the links below. LENNOX is a INNOCENT DOG and a little Girl is crying for her friend – how can this man be so hard to do this to a diseased Girl. I often speak of how important it is to keep body, mind, and spirit in balance, but am often reminded of how unbalanced we have become as a society. Every time there’s morning rain in Los Angeles, traffic falls apart, for example. Living in big cities we can forget how to stay balanced and live in the natural world. My clients remind me constantly—or they wouldn’t be my clients. Some are Harvard graduates, but they can’t walk a Chihuahua. Because you need more than intelligence to create a connection with Mother Nature. Many of us have lost that connection and it is reflected in our animals. Dogs are our mirror and when they’re not following us it’s because we’re not balanced. Being unconditional, that’s a dog. Humans are very conditional. Dogs, accepting. You can look horrible, but a dog will look at you like you’re the most beautiful human being ever, because what he’s looking at is your feelings. Dogs have integrity. But many humans measure integrity materially, with money. That’s how disconnected and unbalanced we have become. If I can help people to understand how simple it is to reconnect ourselves back to Mother Nature, then the payoff we get is community life, country life, world life. Because… if you transform your relationship with your dog and your neighbor does too, the whole neighborhood will feel it. There are thousands of dog issues, but at the end, they’re all the same. Unfortunately, the world does not live in prevention mode, just intervention mode, ignoring an issue until it becomes a major problem. That’s because there’s no money in prevention. But the benefits of prevention are enormous—it gives us a balanced world, a lot of happiness, and a lot of health. That’s real integrity. Working with Mother Nature, not against her, is the best prevention in the world, rain or shine. Thank you to those who have left the above comments to this post. It has always been my belief that there is no such thing as a ‘bad dog’; there are bad people, bad owners, irresponsible owners, neglectful and abusive owners, owners in it for the money!!! 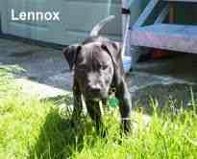 LENNOX is a much beloved, gentle and affectionate member of a devoted family, committed to his health, welfare and care. LENNOX is NOT a product of bad people, bad owners, irresponsible and cruel owners, owners in it for the money. It is a total miscarriage of justice that this beautiful loving family member has been held for over a year on Death Row to begin with..it is a travesty that the Magistrate in this case has failed to reverse his decision and to return LENNOX to his family..despite the statement issued by Sarah Fisher, despite the evidence in support of LENNOX, despite the International outrage and protest..to ignore all of this is unacceptable, unforgiveable and intolerable. LENNOX’s time is running out, to take the life of this innocent dog who has done absolutely nothing to deserve incarceration and death…will not only destroy LENNOX himself, but also in his death, a part of each one of his human family members will die as well. We all have experienced the loss of a family pet, it is devastating. Destroying LENNOX, not admitting to the serious mistake made in his seizure to begin with, his mistaken identity….failing to put pride in one’s pocket…and failing to return LENNOX to his family…..will also destroy what little faith may remain in the Justice system period as well as those Public Servants employed in Belfast and so-called specialists involved in this case. 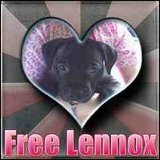 An appeal to HIGHER Authorities, such as the President of N. Ireland and the Supreme Court need be and should be made by everyone around the World to Save Lennox. To LENNOX’s human family, THANK YOU, for the great love, for the great fight, for your continuing battle to save him….no family should EVER have to endure what you have for so long…no family pet should ever have to suffer as Lennox has..
YOU are an inspiration to us all and your courage and strength is immeasurable. Around the World, LENNOX’s supporters are outraged!! NO ONE WILL EVER FORGET LENNOX and the pain, misery and disbelief inflicted upon his family, his supporters and on LENNOX himself. The evils done to Lennox and his family shames Ireland and all who carry the bloodlines of Christ. When any nation dispises the command of Jesus: “Be compassionate as your Father is compassionate” and who violate God’s laws of stewardship and builds sorrow throughout Heaven, be not surprised if God withdraws His blessings upon the nations and leaves the world to drown in the pool of evil it has created. I have been following Lennox’s plight and can’t understand why the magistrate just can’t admit that the are wrong in their assesment of Lennox and have reviewed the matter incorrectly and allow Lennox to go home. If I can make an effort all the way from Cape Town in making others aware and even sent an Xmas card to Lennox, then surely these so called people of authority can come down from their high offices and show an animal and its loving family goodwill and compassion by letting Lennox return home. We’re not giving up Lennox. 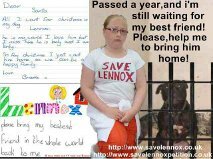 Please Belfast see what you are doing to this little girl, her family, and Lennox! This little girl needs her pet and not only is Lennox her pet but her friend. Please look inside your heart and do the right thing by sending Lennox home with his family! Thank you! !